Earlier this week, the repair experts at iFixit opened up the 2018 MacBook Pro, uncovering Intel's new JHL7540 Thunderbolt 3 controller, introduced earlier this year as part of its "Titan Ridge" family. While the specifications for the JHL7540 lists compatibility with DisplayPort 1.4 on Intel's product database, it's not as clear-cut as it sounds, as support also relies on graphics, which vary by MacBook Pro model. The new 15-inch MacBook Pro with Touch Bar models support DisplayPort at High-Bit Rate 3 (HBR3), a signal standard of both DisplayPort 1.3 and DisplayPort 1.4. Apple says the dedicated Radeon Pro graphics can drive up to two 5K displays at 60Hz, each over a single stream. The new 13-inch MacBook Pro with Touch Bar models support DisplayPort at High-Bit Rate 2 (HBR2), a signal standard of DisplayPort 1.2. This is a limitation of the Iris Plus Graphics 655 in these models, as Intel's integrated GPUs do not support DisplayPort 1.4. The new 15-inch MacBook Pro theoretically supports DisplayPort 1.4, which Apple confirmed, but at least for now, it still can't drive an 8K display. It could be possible with VESA's lossless Display Stream Compression standard, perhaps, but it's unclear if this can be enabled down the road. 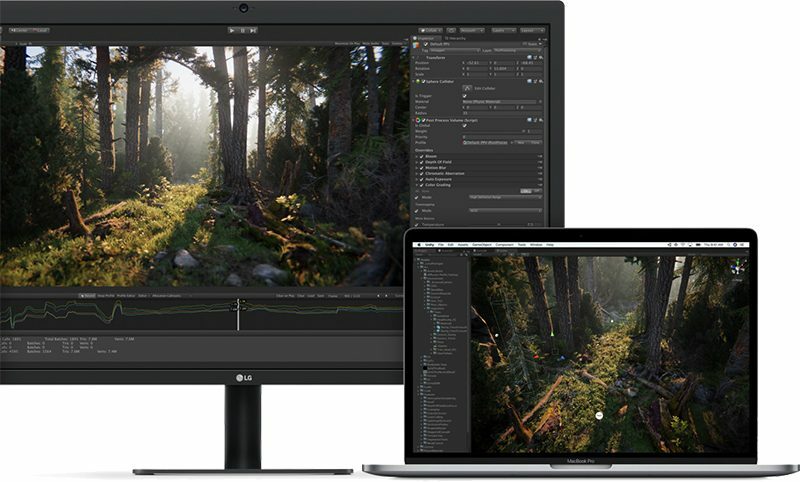 For now, then, the new 13-inch and 15-inch models have the same compatibility with external displays as the previous-generation MacBook Pro: up to two 5K displays or up to four 4K displays on the 15-inch model, and up to one 5K display or up to two 4K displays on the 13-inch model. For comparison, 2016 and 2017 MacBook Pro models are equipped with Intel's JHL6540 Thunderbolt 3 controller, which supports DisplayPort 1.2. In related news, Apple has also confirmed that all four Thunderbolt 3 ports on the new 13-inch MacBook Pro with Touch Bar are now full speed, compared to only the two left-facing ports on the equivalent 2016 and 2017 models. It does very little if the thermal throttling issue isn't fixed. I doubt creating your unpacking videos are going to be affected by that issue, so you're good to go, dood. Put it in a fridge and it will run an 8k @ 60hz external display. I went into the Apple Store in Anchorage yesterday to buy the 2018 MacBook Pro 13". I was committed to the purchase way before I walked in the door. But a casual glance at the ports on the MacBook caused a pivotal revelation. The ports on their flagship line are only Thunderbolt 3. And NOTHING else. This is unbelievably shortsighted to the point that I'm certain Apple has lost its way. There are ZERO compatible ports on this new machine. I can't plug my iPhone into it, I can't plug my thumb drive into it, I can't plug a peripheral into it, I can't plug anything but the power cord into it. Really? This is the FLAGSHIP? I need to carry an external dongle to plug anything into my flagship Apple? That's ridiculous! I didn't buy the MacBook. Apple has lost their way. I've made the decision this morning to give up on Apple. I just ordered a new Microsoft Surface Pro a few minutes before writing this. Too bad Apple, you're your own worst enemy. Kinda makes me wish they'd widen the gap between the "Pro" and the "Non-Pro" MacBooks. Make the MacBook/MacBook Air the super thin, light, inexpensive option, while the MacBook Pro is thicker, but with higher end GPUs, and better thermal limits. We’ve stepped backwards in terms of usability. Now, even though all the ports and cables look the same you may or may not have the functionality. It’s such a complex world! One universal port, so many combinations of features. I remember when all this technology made sense to me. Now, I care less and just think “This just doesn’t work for me.” Not just USB-C, but all the annoyances in Windows, and Office365. Mostly not with my iPhone and macOS though. Technology is getting more annoying. I'm so mad I can't do something none of us planned to do anyway! Just kidding, loving my new 2018 MBP. Thing is a beast. Great machine, selling my 2017 Pro to upgrade.